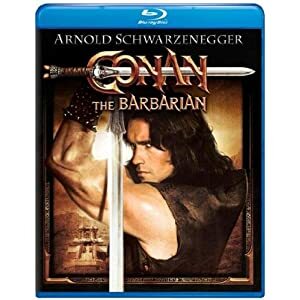 Conan the Barbarian is the first Conan movie. We learn how Conan grew up to be big and strong, and how he learned to use a sword so well. The film opens with this narration. "Between the time when the oceans drank Atlantis, and the rise of the sons of Aryas, there was an age undreamed of. And unto this, Conan, destined to wear the jeweled crown of Aquilonia upon a troubled brow. It is I, his chronicler, who alone can tell thee of his saga. Let me tell you of the days of high adventure!" High adventure, indeed! This is one of my favorite films of all time. I love swords and sorcery movies. Even though this movie is over 20 years old, I totally love it. Every time it comes on TV I watch it, which is silly since I own the DVD. I think this movie is way better than the second one, but I am really sad that there were only two of these movies made. Maybe they will make more? There's a whole bunch of Conan books, so they could make more of them into movies with a different guy playing Conan. Hollywood, you listening?